On January 29, 2018, the Mayor and Council passed a resolution that will permit the sale of cannabis in Thompson once it becomes legal on a federal level. 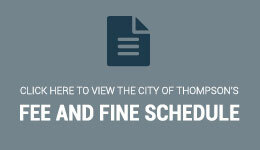 However, the City of Thompson has the ability to further shape the way that cannabis will be sold and consumed within city limits. To better understand what members of our community would like to see, we've prepared this survey that touches on the key points that make up a comprehensive cannabis by-law.